An investigation into the disappearance of Sgt. 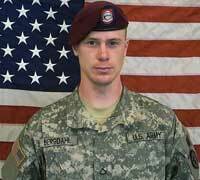 Bowe Bergdahl from a military base in Afghanistan in 2008 is complete, though the results of the investigation will not be released until senior Army leaders have a chance to follow up with questions. “Clearly we are in a holding pattern,” said Bergdahl’s attorney, Eugene Fidell in a CNN interview Friday after the Army issued a statement saying the investigation was complete. Fidell said Bergdahl is a “grateful human being,” thankful to President Barack Obama for his release. “He [Bergdahl] is one tough hombre,” Fidell said. Bergdahl was released in May after five years in captivity, in exchange for five Taliban leaders held at the U.S. military detention center in Guantanamo Bay, Cuba. Critics claim that the prisoner exchange violated the law because the Obama administration did not first consult with Congress, and that the five Taliban leaders could return to military campaigns against the U.S.
Due to the controversy surrounding Bergdahl’s release, and angry emails and letters aimed at Hailey City Hall, a welcome-home party planned for him last summer was cancelled. CNN reported Monday that sources say that Bergdahl is now “communicating” with his parents, but that a face-to-face reunion still has not taken place. CNN said the sources would not elaborate on how Bergdahl is carrying out the communications. In August, Bergdahl was questioned by Gen. Kenneth Dahl for two days. The results of the investigation are expected to determine if Bergdahl will face any criminal charges in the military justice system for the manner in which he left his post in the Paktika Province of Afghanistan in June 2008. An interview given to Rolling Stone magazine in 2012 by the soldier’s father, Bob Bergdahl, indicated that Bowe Bergdahl may have had personal reasons for leaving the base. Bergdahl’s critics claim he is a deserter and that his disappearance put fellow soldiers in danger. It is unclear when the world will have answers to the many questions surrounding Bergdahl. Fidell said Bergdahl has been increasingly exposed to the news surrounding his release.